Avengers: Infinity War is the blockbuster that every Marvel fanatic is waiting for. From Iron Man to Star-Lord to Doctor Strange, the joint forces meant to defeat Thanos are bound to break box office records in more ways than one. Although the film isn’t set to release until May 2018, Infinity War enthusiasts can see their favorite superheroes combine forces in the next best thing: Marvel Universe Live! 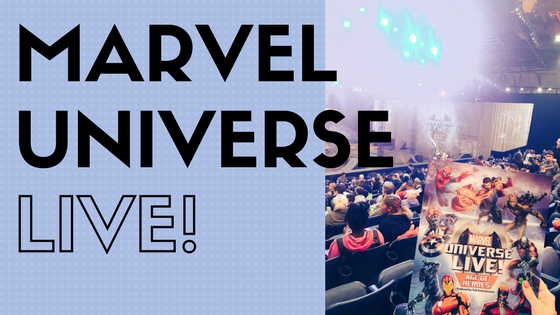 Marvel Universe Live! Age of Heroes will be travelling 16,680 miles during their 2017-2018 tour as they share the story of The Wand of Watoomb and the fight against villains such as Nebula and Loki to keep the wand from evil. The story begins with Doctor Strange, an expert surgeon who suffered serious nerve damage and turns to the mystic arts to make up for his disability. He has been alerted by Sorcerer Supreme of the Wand of Watoomb and the danger it possesses if Thor’s villainous brother gets his hands on it. By calling on the Guardians of the Galaxy and the Avengers, he’s hoping that they can get to the Wand before Loki does. The cast is nothing short of heroes and villains. From favorites such as Groot and Spider-Man to Lizard and Green Goblin, their stories and their worlds interweave throughout the show. The storyline captures the characters that have been seen both on the big screen and in smaller, animated form. It captures the banter of the Guardians – “My knuckles are not on my head, they’re on my two mighty fists!” – down to the ultimate Hulk Smash. The dedication of each crew member shows in every piece of the set. The sets change from the Federal Reserve Bank of New York to Avengers Tower to Savage Island and many places in between, using 23 different projectors and 336 light fixtures – 184 of them which move. The props and set elements of the show were built to be usable and practical, resembling a parkour gym. It takes approximately two days to set up the show, from trap doors to hanging speakers to Loki’s throne. Highlights of the show include electric aerial stunts from Spider-Man and Wasp, fearless motorcycle stunts from Captain America and Black Widow, the array of stilts used for characters such as Groot and Lizard’s unforgettable acrobatic entrance. Marvel Universe Live! Age of Heroes will finish their 2017-2018 North American tour dates before embarking on an international tour in 2019. With the two-part Infinity War films set to release around the same time, the show is sure to capture audiences around the world.